Atletico Madrid have quietly had an excellent season in La Liga. All the talk has been about Barcelona’s superb form, still undefeated, Real Madrid’s disastrous campaign which sees them 14 points behind the Catalans or Valencia’s great performances under Marcelino. It’s gone slightly under the radar that Atletico have still only suffered one defeat, lie comfortably in second seven points behind Barca and have only conceded 11 goals. After a 5-2 crushing at Sevilla on Sunday night, people better start taking notice. In this post I’ll take a look at their win at Sevilla and the tactics behind it as well as look at the stats behind their sublime defensive record which sets them apart as Europe’s best defensive team this season. Sevilla coach Vincenzo Montella continued with a 4-2-3-1 formation which had Sergio Rico in goal, Jesus Navas, Gabriel Mercado, Clement Lenglet and Sergio Escudero in defense, Steven N’Zonzi and Ever Banega in central midfield with Pablo Sarabia, Franco Vazquez and Joaquin Correa the trio behind striker Luis Muriel. Diego Simeone went with a 4-4-2 as normal and deployed Jan Oblak in goal, Sime Vrsaljko, Jose Gimenez, Diego Godin and Filipe Luis in defense with Saul, Gabi, Thomas and Koke the midfield quartet. Up top was Antoine Griezmann joined by Diego Costa. One of the key reasons Atletico raced into their five goal lead was their sublime pressing. To prevent Sevilla from building from the back, Atleti went high with their strikers and midfielders in man-orientated pressing schemes. The focus was always to force Sevilla wide or to lure them into risky passes into central areas. Below is an example of their high pressing as the front two would work together to block off the switch of play as the ball had reached Sevilla’s split centre-backs. The wide midfielders Saul and Koke would block a central pass until the ball was about to be played wide to the full-back which is when they would press. The ball-near central midfielder, Thomas below, would mark the Sevilla midfielder looking to receive while the other, Gabi in this example, would cover behind his teammate. A similar situation in the example below but on Atletico’s right side. Here you can clearly see Saul staying centrally to block off a pass inside Atletico’s block to instead force Sevilla wide. The effective and aggressive pressing led directly to a couple of the goals. The prime example was the first goal when Sergio Rico was lured into making a pass into Banega just outside Sevilla’s penalty area. The Argentine was quickly pressed by both Costa and Gabi and the striker stole the ball and made it 1-0 to Atletico. Atletico often attack with close distances between their players as can be seen in the image below where both Saul and Koke (both yellow) has come inside either side of Griezmann (white) to overload the central area while Costa leads the line and the full-backs push on down the flanks. This is of great benefit to their superb counter-pressing which further made life difficult for Sevilla. This instance below is a prime example as four players surround the ball-carrier just after possession has been lost. The pressing causes a mistake a few seconds later when the ball is played back towards the goalkeeper and intercepted by Griezmann who tees up Koke for the fourth. 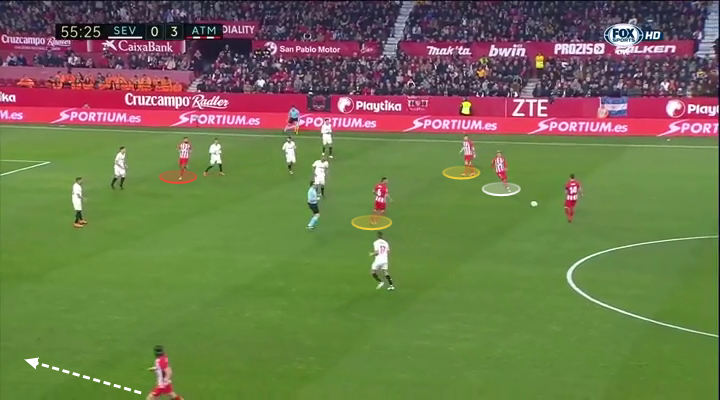 Ever since Simeone took charge of Atletico they’ve been a reference model in how to defend as a unit and keep a compact shape out of possession. As always, they delivered in this regard against Sevilla. Below is an example which illustrates the immense vertical and horizontal compactness of Simeone’s side. It’s a sight for sore defensive eyes. I’ve highlighted the maximized width Sevilla used to try to force gaps within that defensive structure. It truly is impressive to see how they constantly moves as a unit to limit space centrally and between their lines. Look at the space between the defensive line and the midfield line. Can’t find it? Neither could Sevilla. Atletico used the same principles as they always have done; the wide midfielders block central passes and allow the opposition wide where the full-back often will press and will then be covered by the wide midfielder and the ball-near central midfielder. 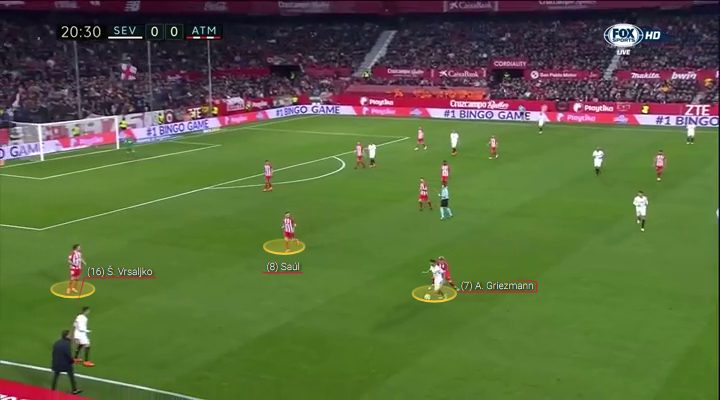 One example of this is below where Griezmann pressures the opponent with Saul keeping a central position while Vrsaljko is ready to press in the wide area. Gabi was excellent throughout the game from his position in central midfield and showcased his intelligence by making a series of interceptions and important pressing actions in midfield. I’ve highlighted one of those interceptions below as he reads the pass into the centrally positioned Sevilla player. He quickly steps in, intercepts the pass and sets Griezmann and Costa away on the counter-attack. As I mentioned above, Sevilla tried to combat Atletico’s compactness with maximum width down both flanks, but this didn’t trouble Atletico in the slightest as they duly shifted across when Sevilla switched sides. They were happy for Sevilla to circulate the ball in wide areas or in front of the front two of Griezmann and Costa but refused to allow any passes inside their compact block. It comes as no surprise then that Sevilla’s left-back Sergio Escudero had more touches (116) than any other player on the pitch. The wider positioning of Atletico’s full-backs, as seen below, allowed both Vrsajlko and Luis to quickly react to switches of play and remain in access of their opponents safe in the knowledge that they had cover from Saul or Koke. Finally, I feel it’s important to note how important the role of the strikers is for Atletico’s defensive style. They were always aggressive and full of energy to press when they could, but also played their roles within the positional structure perfectly. Their mere presence just a few meters in front of their midfield restricts Sevilla’s opportunity to lure Gabi or Thomas into pressing their midfielders which would vacate space in front of Atleti’s defense. With Griezmann and Costa so tight in front of the midfield, the central midfielders can focus on closing space in front of the back-four. When Atleti had the ball, they either looked to quick counter-attacks through their front two in particular or through a more patient build up with the positioning in central areas I mentioned earlier. They used Costa in an interesting role on other occasions though. The striker would often drift wide towards the left where he would be up against Jesus Navas. Against Navas, Costa had a clear height advantage and Atleti would then look to find him with longer aerial balls and would then have players ready to run onto any headers from the striker. When Navas went off injured, Costa continued to move wide, but the long balls were generally meant to go in-behind the right-back rather than on Costa’s head. 11 goals conceded in 26 matches is the best defensive record in Europe. It’s worth to remember that 18% of those goals were conceded in the last five minutes against Sevilla when Atleti, 5-0 up at that point, were cruising and switched off slightly. When looking at the stats behind this, we see that Atletico are vastly over-performing in their expected goals. Atletico’s expected goals against, xGA, are 23.26 but they have only conceded 11. That means they *should* have conceded twice as many as they have based on the chances created against them. The reasons behind why they haven’t are probably a combination of poor finishing from opponents, pressure from Atletico defenders on the shooter and the fantastic shot-stopping ability of their goalkeeper Jan Oblak who has saved more than 84% of the shots he’s faced. The situation is similar to Manchester United who have conceded 20 goals in the Premier League while their xGA are 33.43 and are often saved (literally) by the brilliance of former Atletico goalkeeper David De Gea. By contrast to Oblak though, De Gea has a lower save percentage at 78% which further highlights the quality of Oblak. It seems then that Atletico’s defensive style restrict opponents to few opportunities but when they still find chances, Oblak often stands in the way. Simeone has created a superb defensive organization and when breached he can count on the brilliance of his Slovenian goalkeeper. That seems to be the secret behind Europe’s best defensive record. Against Sevilla, Atletico showed all their class in a brilliant 5-2 win which came thanks to their excellent pressing, compact defending and attacking quality.